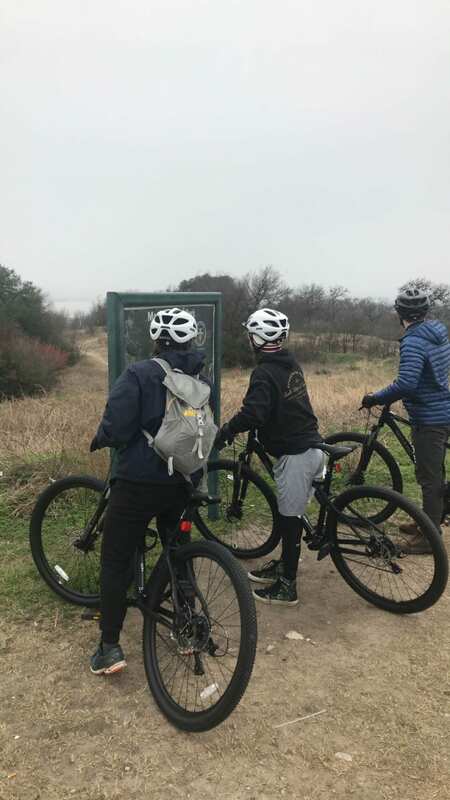 On a chilly 32-degree Saturday morning, four SMU students met at the Outdoor Adventures office in preparation for an exciting day of mountain biking. Despite it being a cold early morning, it seemed nothing could stifle the energy of the eager group. As we approached Marion Sansom Park, we we’re met with a beautiful forestland draped by a light fog with a scenic waterfall and a vista of Lake Worth: a sight so charming that it was almost hard to believe that it only lay 45 minutes away from campus! When we arrived, we wasted no time preparing all the equipment so that the group could begin the excitement as soon as possible. At first the trails seemed daunting, but the group’s taste for thrill and adventure was to match: we sped through the trails, exhilarated by every decline, jump, and obstacle that we met. Along the trail, we were able to find a captivating waterfall to enjoy as we took a minute to catch our breathes. Before long, we continued to tackle the trails, only stopping to enjoy a brief lunch of fruit and delicious sandwiches. 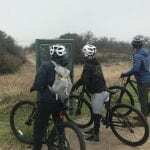 Every inch of the trails was an adventure, the group being met with different declines, twists, hedges, and turns. Everyone’s thirst for one more trail seemed to never waiver. However, the day of excitement would eventually have to come to an end, and thus the group climbed back up to the car to pack up the gear and head back to campus. While exhausted, we returned very content with the day’s thrilling experience.